When your attic’s insulation is functioning properly, your heating and cooling system can regulate the temperature consistently throughout your house, leaving you with a more comfortable home and lower energy bills. It can be easy to forget about the insulation in your attic, especially if you never have a reason to go up there, which is why 911 Attic Services is equipped to provide those living in San Diego County with the attic insulation clean out and installation services needed to maintain your home all year long. The truth is that there is a big difference between old and new insulation. When attic insulation becomes dirty and damaged, it not only becomes ineffective, but it can be harmful to your health. Removing damaged insulation is the first step our specialists will take to get your attic clean and back to efficiently regulating the temperature in your property. It is common for rodents to build nests in roof insulation, which then contaminates the entire home when the dust and debris travel through the air ducts. If we discover that your attic is filled with animal remains, feces, and insects, you can rely on us to remove the insulation, clean the space, and reinstall new insulation. Although you may be concerned about the cost to insulate your attic, keeping old insulation will end up costing you more money than you would spend on the install by eating up the energy your home intakes. When you are searching through attic insulation companies to perform your insulation install, save time and money by making 911 Attic Services your first call. 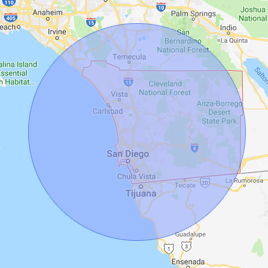 So, whether you live in Escondido or Chula Vista, you can depend on our team to provide you with a free inspection and the peace of mind you deserve. There are two different types of insulation that can be used in your attic and under your roof, and even though each type is equally effective at insulating your home, there are aspects of your attic that may make one more suitable for your property. Batt insulation is the most cost-effective way to insulate your attic because it comes in “blankets” that are packaged in large rolls. This option is appealing for homeowners with standard-sized attics because the under roof insulation of an attic can be completed by rolling out the blankets and securing them into place. Blown-In insulation is the best option for uniquely shaped attics since it is loose insulation that is blown into place with a particular machine. This installation technique makes roof insulation easy and allows for the insulation to fit into any sized space. Batt and Blown-In insulation are typically made from fiberglass, which is a material made out of fine threads of glass that have been bound together. 911 Attic Services recommends that you allow only their professionals to handle fiberglass insulation due to the risks involved with exposure. If you are not adequately protected, fiberglass can irritate your skin and eyes upon contact. Inhaling fiberglass can also affect your health by causing soreness in your nose and throat, and has even been known to lead to asthma and bronchitis. 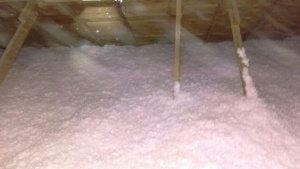 If you are not comfortable with fiberglass attic insulation, then you may want to consider using cellulose insulation. This type of insulation is an eco-friendly option that is made from recycled newspaper and cotton. Cellulose insulation is available in Batt and Blown-In options. The technicians at 911 Attic Services are experts in removing and installing blown-in and batt insulation in both fiberglass and cellulose. So, play it safe and allow the professionals at 911 Attic Services provide you with the attic insulation clean-out that is best for your home. How Long Does Insulation Last In Your Attic? It is not possible to give insulation a precise expiration date due to all the different factors that will determine the length of time that your insulation will last in your attic. However, the U.S. Department of Energy suggests that property owners have their insulation inspected at least once a year. If you live in a city close to the beach, such as Oceanside, then your attic may be affected by a roof leak, rodent invasion, or mold infestation, and your insulation will most likely become damaged and may need to be replaced. To best maintain your home it is necessary to have the experts at 911 Attic Services come to inspect your property after such an event occurs. Although you may be tempted to remove attic insulation, it’s important to hire professionals to conduct the attic insulation removal. Batt insulation can be filled with dust and hazardous debris that can affect your health, but specialists will safely remove the insulation and dispose of it properly. Along with removing Batt insulation, the attic insulation techs are qualified to remove Blown-In attic insulation, which has proven to be a difficult task. To remove every trace of the insulation, the technicians will use a custom-designed, high-powered vacuum. All of the dust and debris will be thoroughly suctioned out into a large-volume, filter bag, specifically designed to collect the insulation material. The old insulation is then safely removed from the home. By hiring 911 Attic Services, you can be sure that you are avoiding any risk of contamination, which can happen when trying to remove insulation material directly through the inside of the building, rather than channeling it outside with the correct equipment. So, when you need your attic insulation reinstalled, you can depend on the techs in San Diego County to get rid of the fiberglass in the safest way possible. 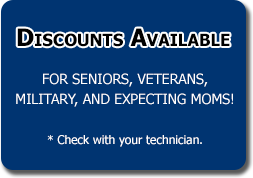 Contact 911 Attic Services today, and we will give your attic a fresh start.